When the International Air Transport Association director general and chief executive officer Giovanni Bisignani was told that Terminal 3 of the Delhi International Airport would be completed in 36 months, the Italian chief of the aviation trade body that represents 93 per cent of scheduled air traffic had taken the timeline with a pinch of salt. After all, Indian infrastructure projects have a chequered history of delayed implementation. But on Thursday, when Business Standard asked him what he felt about the Indian aviation sector, Bisignani was effusive in praise of the project that was completed in record time by a joint venture consortium of GMR Group, Airports Authority of India, Fraport and Malaysia Airports Holdings Berhad. "In India, infrastructure was seen as a problem because of the time (taken) for execution. But the example of Delhi is really amazing. 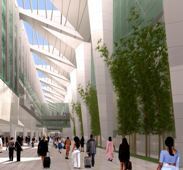 "I think India astonished everybody, and Delhi is an example of a great airport," said Bisignani. "India needs more miracles like this." Despite the bullishness associated with India, IATA has flagged taxation and fuel charges as key areas of concern for the aviation industry in the subcontinent, which is among the fastest growing in the world. In April, for instance, IATA figures indicated that the Indian domestic passenger market grew by 25.6 per cent year-on-year, the most prolific globally. "On top of the $330 million already collected in service taxes on premium travel, we were disappointed in the $150 million increase with its extension to economy with effect from April 1, 2011," IATA said in response to emailed questions, referring to Finance Minister Pranab Mukherjee's Budget announcement of increasing service tax on domestic air travel by Rs 50 and Rs 250 for international routes. "It is against the principles agreed through ICAO (of which India is a council member) and should be removed entirely," IATA added. ICAO is the International Civil Aviation Organisation, a United Nations agency that sets the standards and practices for air navigation. Although domestic aviation turbine fuel prices have been on the downward trajectory in recent weeks, IATA made a case for further reduction. "Fuel purchases in India are not competitive to what is charged in other markets because of excise duties, throughput fees by airports and state taxes (which can be up to 30 per cent)." Apart from calling for greater transparency in fuel purchases, IATA also pointed out the need for clarity in air traffic control charges. "We estimate that international carriers are paying 20 per cent than domestic operators. Charges should be cost-based, transparent and non-discriminatory (as per ICAO principles)," the trade body said.